A keggle is not really as complicated as you may think. All it requires is a bit of planning, a couple tools and some parts. 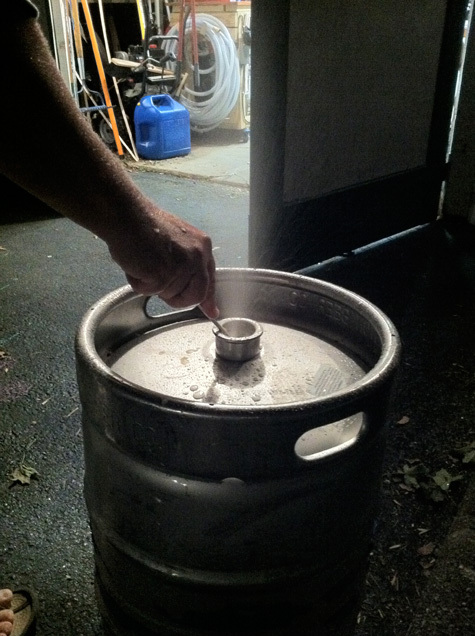 Of course you’ll also need a keg. How you procure a keg I’m not going to get into, we will just assume you acquired nice and legal like. The first thing you want to go is to remove the center dispensing tube. 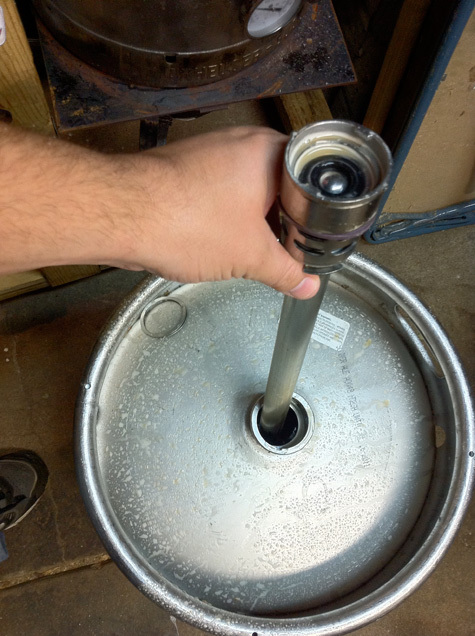 To do this you want to release the pressure in the keg with a screw driver. 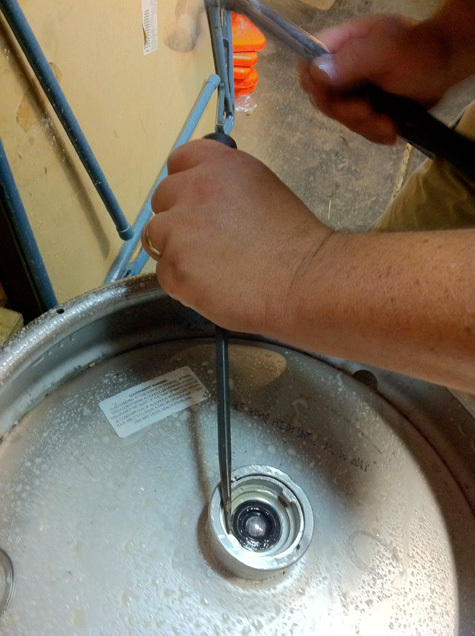 Then remove the small o-ring that holds the tube in the keg. With the ring removed you can pull out the dip tube. The next step is the make it or break change, cutting the top. You want to make the opening as wide as possible, ~12 inches. There are several ways to do this. You can go to a welder and have them cut the circle with a plasma cutter. Or, check out the many DIY methods online. 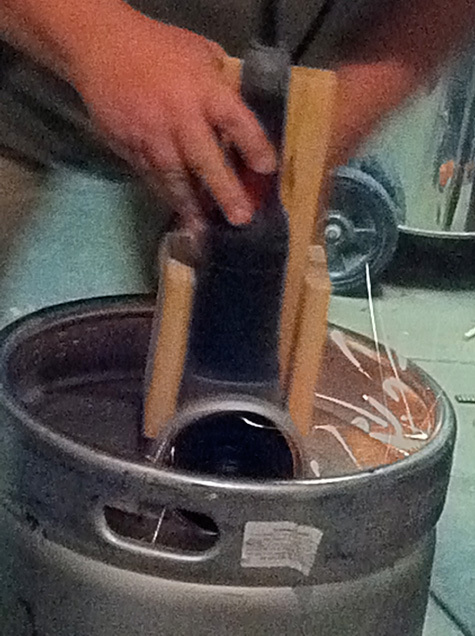 For my keggle, my friend Chris used his angle grinder with a jig to cut a nice circular hole for me. Be careful with this method, it is loud and the red hot steel splinters will hurt… use eye protection! Here is where the DYI keggle build methods start to vary, you have the basic kettle at this point. Now you can make it as nice and as fancy as you want. For my keggle I wanted it functional as well as nice to look at. 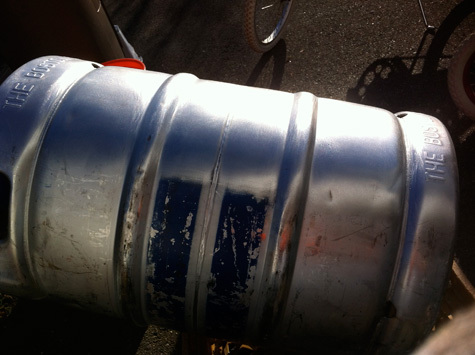 I spent 3 days sanding and polishing the outside of my keggle so it would look as nice as it will be functional. First I started with 60 grit sand paper on an orbital sander. This took all the crud, paint, and other crap off. But since 60 grit paper is very rough, it leaves a ton of scratches. The next pass I used 120 grit paper with the orbital sander on the kettle. This grit leaves even more scratches then the 60 grit, but at the same time starts to smooth out the surface. The next pass was with 320 grit paper on the sander. This pass really smoothed out the surface, but there was still a lot of scratches left from the orbital sander. The final pass, I used 1500 grit wet sand paper and sanded by hand. 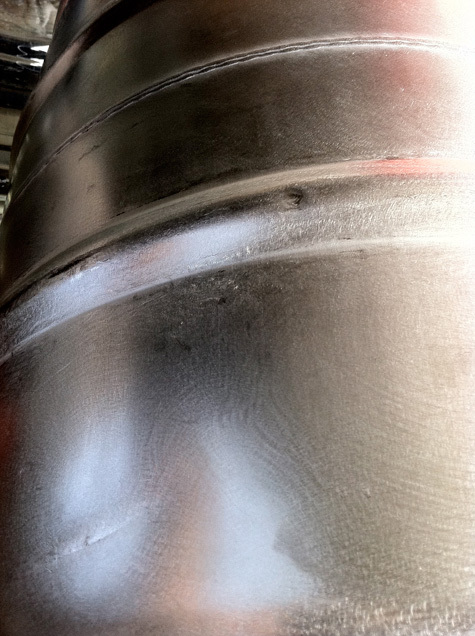 This really gave the keggle a very nice luster and shine. 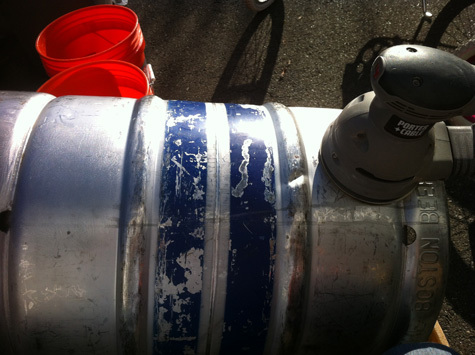 Now with a pretty keggle, it’s time to add the fittings. I highly encourage you to measure a bunch of times, think about how you brew and how you work before drilling the holes. Once you drill the holes, there is no going back. You’ve either done it right or you’ve ruined the keggle. I also want to have a direct fire mash, which requires the mash to recirculate. In order to run a recirculation direct fire mash tun, I need to have an out valve and an input valve. I will also use quick disconnects to fill and transfer to and from the keggle. So, I need to have the holes drilled as low as possible for the out and as high as possible on on the keggle the in. The keg does not go straight up and down at the bottom, so the closest I could get was about 2.5 inches from the bottom and roughly the same from the top. I drilled 3 holes 2.5 inches from the bottom. Left was for the thermometer’s bulkhead, the middle was for the ball valve bulkhead and the right was for the sight glasses bulkhead. make sure you are drilling the right size hole. Measure twice, drill once. The top bulkhead, the input, I set slightly off to the right side. This is personal preference, for my set up this location worked best. I also added a 90° elbow with a quick disconnect on the inside so I can easily remove the recirculation part and have it double as a water input as well. With all the part assembled and tightened, do a water test. 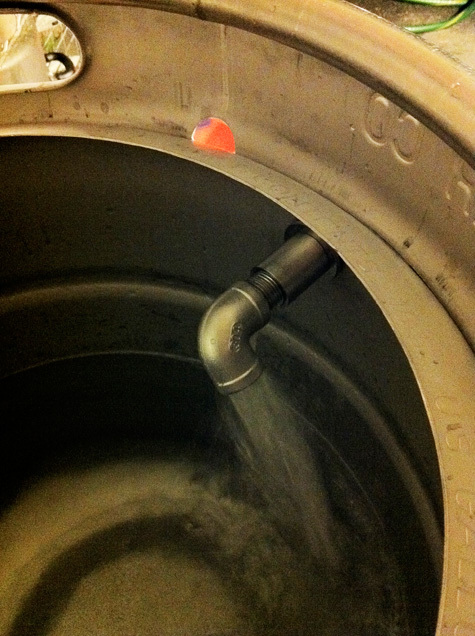 Use the keggle as if you would on brew day and make sure you have no leaks. Once there are no leaks, install the false bottom by attaching the adapter to the 90° uptake tube and screwing it into the inside of the ball value. It really is as easy as it sounds. Take your time and you’ll nail it on your first try. Did you write this article? yes, is there something not accurate? HA! Yeah, Kurt that picture was take a couple months back. I’ve been lazy about getting my posts up. Hi, I stumbled upon your page. I’m actually not a homebrewer, myself, but I toured a small brewery the other day. I am actually a stainless steel pipefitter, welder, and fabricator in the food industry; I travel the country building factories. 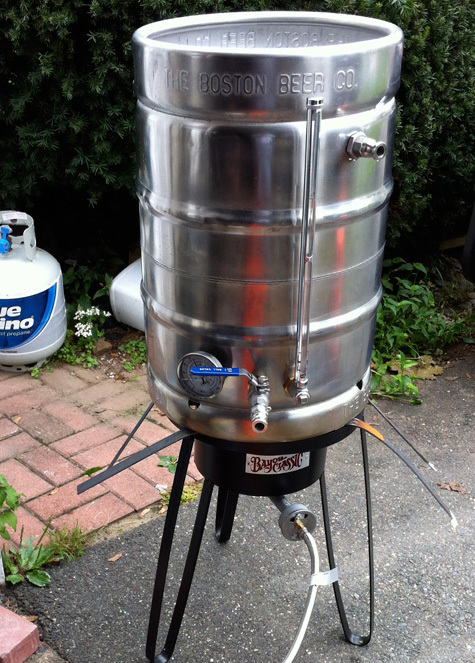 A friend of mine who is into drinking unique beer suggested that I may want to look into brewing equipment fabrication since my specialty is sanitary stainless. I looked around a bit and was shocked at how expensive some of these things are. 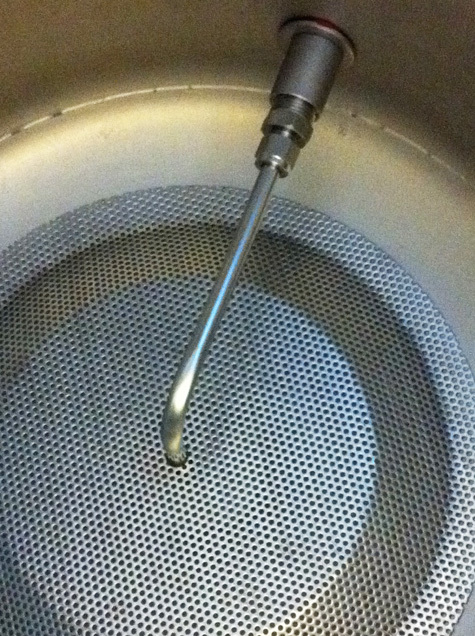 Is there a good resource online for learning about the functions and basic concepts of brewing equipment like mash tuns and other things? Ok, so I’ve been brewing off and on for years now, and really a lot this year (2012). I’m looking to going to an all-grain system, now that I’ve mastered extract brewing. I’ve seen mash tuns made with coolers, but I really don’t like anything plastic touching my homebrew process. Perhaps you can make one of these for me? If so, how much and where do I send the money? Very cool. glad you like it, but it is DIY. 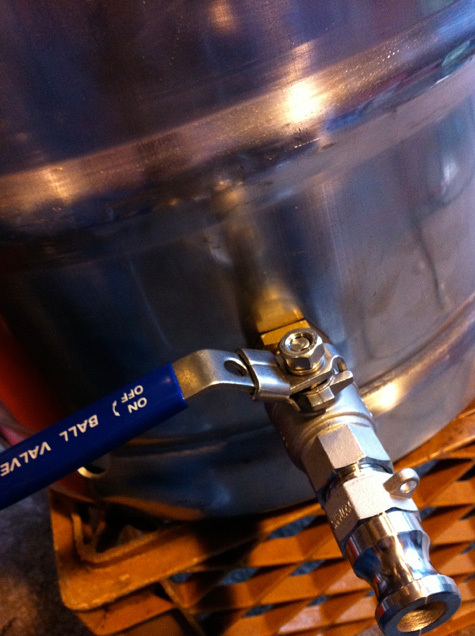 try your local homebrew store or Midwest brewing or northern brewer online for a kettle setup. Looking at mimicking your setup to an extent and had some questions. I plan on putting the thermometer above the ball valve, & no false bottom, using this as my boil kettle. I plan to use the top fitting as a whirlpool and recirc through a pump to get that going. 1.) What volume level is your top valve at? 2.) should i put a ball valve on top to prevent spillage? 3.) do you have any problems with your sight glass, both from heat on the bottom and liquid boiling out of the top? Hi Bobby, I put the top value as close to the top as I could get, it is probably around the 14 gal mark. I didn’t use a ball valve on the top and haven’t had any issues with batches up to 10 gal. Never had any issues with the sight glass either, it comes out of the keggle around the 3 gal mark; I also have the bg14 banjo burners which put out a ton of heat. Hope this helps. Cheers! what are you using in the top port while recirculating? Sorry Zach, this got stuck in my spam comments. The top port is where the mash comes back through, I have a adjustable hose to gently push the wort back on the grain bed. What size male fittings are those on the top bulkhead and the ball valve? Did you make your own bulkhead out of different parts from a hardware store or did you buy it pre-built? seems like you can get things a little cheaper if you go with brass. I bought a weldless bulkhead, brass ones are definatley cheaper, but they tend to oxidize(or tarnish) over time. on the finished product, what is that tube in between the in valve and out valve? That is a sight glass, gives you the water level in the pot. Next story The Hops are to Big for My Trellis!